Of the three major arts of self-expression—fine art (principally painting and sculpture), music composition, and writing—writing can be the most utilitarian (instructions for your latest digital gadget, for example), and thus the most mundane. It is also the most universally applied. Nearly everyone learns how to write. Not everyone, indeed not the vast majority of us, learns a fine art or music composition. This universality of application has led writing to often be considered more a skill than an art, more a craft than a conveyance of inspiration. There is, of course, poetry, which few practice and not much more than a few read. And fiction, much of which feature writing that is decidedly utilitarian and depressingly mundane. So when good writing—the intelligent and inspired stringing together of words to form sentences and paragraphs to convey ideas and facts; to tell stories; to portray physical and mental landscapes; to reveal character; to revel in emotions—does on occasion rise to the level of the finest of fine art and music composition, that is a precious thing. 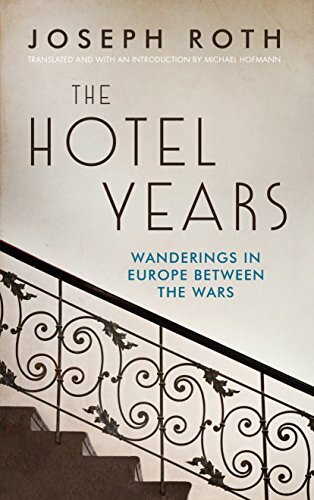 For readers who do cherish such writing, the publication of The Hotel Years by Joseph Roth (translated from the German by Michael Hofmann) should come as a complete joy. Especially when one considers that the 64 short pieces in this collection—written in the 1920s and 30s—are journalism. For journalism can often be ephemeral, especially when published, as it almost exclusively was in the last century, on thin newsprint—light, sometimes loose sheets of paper that could be blown away with a breeze. Joseph Roth (1894–1939) was an Austrian-German journalist and novelist. He quit his university studies in philosophy and German literature to serve in the Imperial Hapsburg Army on the Eastern front during World War I. It was, as it was for many, a major influence on his life. But it was coupled with another major influence, the collapse of his “fatherland,” the Habsburg (or Austro-Hungarian) Empire. This gave him a deep feeling of homelessness, which permeated and possibly enhanced his work as a traveling journalist. After the war he returned to Vienna, where he had gone to university, and started writing for left-wing newspapers, signing his work as “The red Joseph.” He moved on from there to Berlin, finding great success and, in 1923, started writing for the liberal Frankfurter Zeitung, the only publication considered not to be under the thumb of the great Nazi propagandist, Joseph Goebbels. Besides reporting on the immediate events of the day, Roth wrote a series of feuilletons, a special first-person form of short pieces popular in German-language newspapers. It is these feuilletons that Michael Hofmann has gathered and translated for The Hotel Years. Roth’s own definition of what he did in these feuilletons, Hofmann reports in his introduction, was to say “. . . true things on half a page.” Condensed truth, then, or, possibly better stated, distilled truth—truth sharply defined, delineated, and detailed. But what truth? It is not the truth of facts and figures, of data, of concrete realities. It is more the truth one finds in good-to-great works of fiction, the truths of place, atmosphere, moments, tone, aftermaths; the truth of people, of countries, of travel; of hotel lobbies. It is in Roth’s manipulation of words, his inventive metaphors, his clarity of ideas, his powerful, palpable descriptions; his ability to surround you with all the sights and sounds and smells (even when some are not detailed) that he is reporting on, that qualify these short pieces as fine examples of the art of writing. Of course, this is Roth in translation. Does he read as well in the original German? In one sense, it does not matter to the English reader. If Hofmann, who is a poet, has somehow improved Roth, that doesn’t negate the quality of this read. But as Hofmann has translated 14 of Roth’s books, is an award-winning translator, and his love of Roth is apparent in his affectionate introduction, trust is warranted that he has giving us as accurate a rendition of Roth’s German into English—of Roth’s art—as we are likely to get. The title of this collection, The Hotel Years, refers to Roth’s constant travels from the end of the war to his death in 1939, where respites were never “back home,” for he had no real home, but always in a hotel. And the centerpiece, the anchor of the collection, is the section simply titled, Hotels. This is the one section that should be read as one piece, as it contains in its separate feuilletons a chronological portrait of a stay in a hotel from arrival to leaving. It is never stated which of the many hotels Roth stayed at he is describing—although there is a hint of one in a footnote. It is more likely a composite of Roth’s experience of staying in hotels where he was a frequent and welcomed guest. In these pieces Roth perfectly captures the feel of a well-run hotel, the staff that runs it, and the atmosphere—a palpable entity that wraps around one—that is created by comings and goings, smiles and service, decorations and decorum; long-term employment and short-term stays. If you have traveled and stayed at such hotels, you will recognize and remember. If you haven’t, you will want to. Roth probably rarely stayed at truly luxurious hotels. But his writing can be luxuriated in. Steven Paul Leiva's most recent book is By the Sea, a comic novel. His work spans various fiction genres, and also includes essays, a play, articles, and reviews in such diverse publications as The Los Angeles Times, The Bulletin: The magazine of the Science Fiction and Fantasy Writers of America, and Massimo Pigliucci's Scientia Salon. He is a regular contributor to The Huffington Post.